KIEV, Ukraine -- Billboards bearing a picture of Russian Prime Minister and presidential candidate Vladimir Putin have appeared on the streets of the southern Ukrainian city of Zaporozhye, the Unian news agency reported on Wednesday. Twenty posters with the inscription “Stable Russia - Stable Ukraine” appeared in the run up to presidential elections in Russia slated for March 4. The billboards were made upon order and paid for by Ukraine’s Slavyanskaya Gvardiya (Slavic Guard) youth movement. Volodymyr Rohov, the head of the movement, said the move was a reaction to the events in Russia, where thousands of people have been recently protesting against Putin’s rule demanding fair elections. 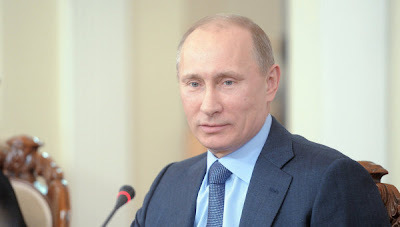 “We are not urging a vote for Putin, although Russia became a strong country once again with his arrival [as president]. We are expressing our opposition to instability in Russia and Ukraine,” he said. Prime Minister Putin goes to the polls next Sunday as one of five candidates for the presidency in Russia. The winner will serve a six-year term.